The bell from HMS Kelly, the ship commanded by Lord Louis Mountbatten from 1939 until it sank at the Battle of Crete in 1941, sold for £7,800 at Bonhams, London, today (March 24). It auctioned against a pre-sale estimate of £2,500-3,500 in Bonhams' The Marine Sale. 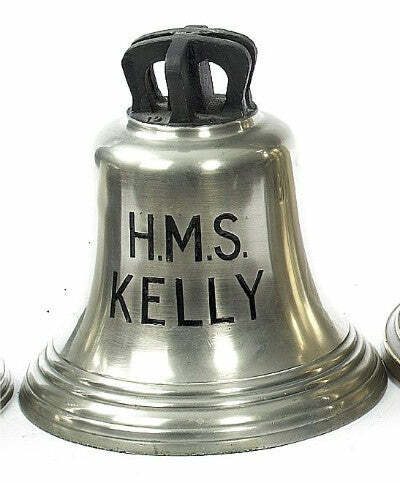 The bell was saved when HMS Kelly was decommissioned for seven months in May 1940. It also inspired Noel Coward's famous wartime propaganda film, In Which We Serve. An Admiral Lord Nelson George III gold and enamel mourning ring, one of 58 rings made by Salter and distributed by the Executors of Nelson's will to relatives, close friends and pall bearers at his funeral in 1805 brought £14,400.